If you do surf internet a lot over PC and Laptop rather than a smartphone, Then I am pretty sure you might have run into “DNS Probe Finished No Internet” error. Well, I got caught in it the other day and could not understand whats happening. At first, I thought its something with my network, restarted modem but no fix later I checked that pages seem to be loading find over the smartphone but not on my laptop which leads to the conclusion that problem is in my computer. So instantly I started searching for a solution online found some ways tried that, but nothing worked for me. Luckily one of my friends suggested me to change DNS and Boom my problem was resolved. It was just a Simple DNS error, and after shifting to Google DNS, everything was working as it should be. 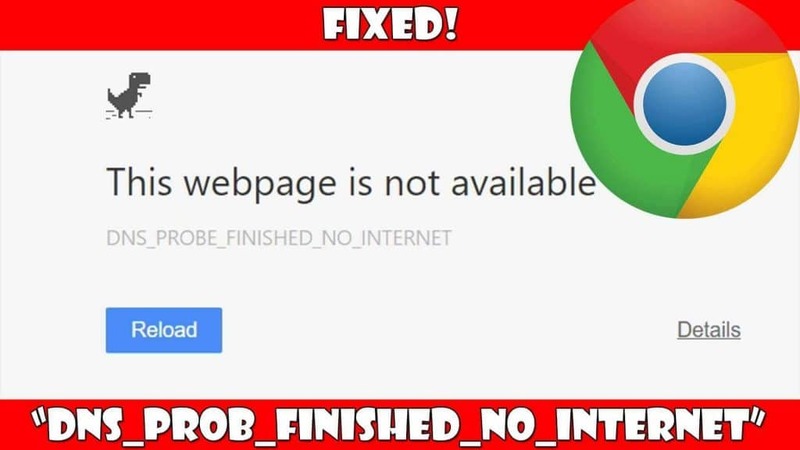 So right after crossing this hurdle, I decided to write an article about the “DNS Probe Finished No Internet” or “DNS_PROBE_FINISHED_NO_INTERNET” so that if anyone ever gets stuck can have a read and get out quickly. Most of the times I have found this happening in Google Chrome(Maybe I am an avid user). But even if you are some other browser still the methods that I have compiled will surely resolve your issues. Below listed methods will help you to fix DNS Probe Finished No Internet issues easily. I have tried my best to include every possible way I could try and find. So let’s start with it. This method might look but difficult but let me assure its the simple and 8 out of 10 “DNS Probe Finished No Internet” can be resolved by applying this. Even I had to follow this method to make things work at my end. Basically, in this method, all we have to do is change the default DNS of your system to Google DNS or Open DNS whichever works. Now look for “Change Adapter settings” and click on that a new window will open, In that, you will also find the network you are currently connected. Right click on it and then click on properties. 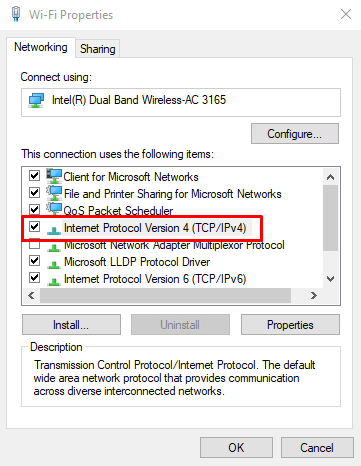 Now you have to find “Internet Protocol Version 4” option, Double click over it and new windows will appear. 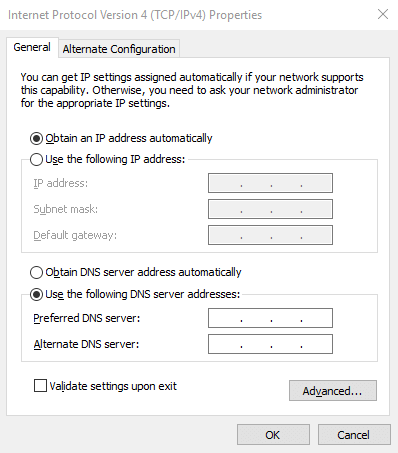 In that window, you will find “Obtain DNS server address automatically” and “Use the following DNS server addresses.” Usually, the former one would be selected, you need to choose the latter, and it will allow you to edit the values in the fields. Now input below provided values in the fields. Now click ‘OK.’ That’s it; You should be able to surf appropriately now if not move to the next method to solve DNS Probe Finished No Internet error. I am pretty sure you are aware what is command prompt and how to access it. 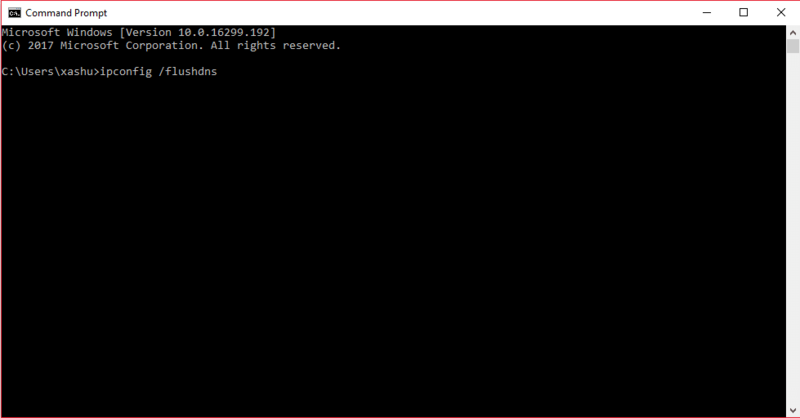 If not, no issues just search for “Command Prompt” or Open Run (Windows + R) command and type in ‘CMD‘ to open it. Now press CTRL + SHIFT + ENTER to open it in Administrator mode. And Press ‘ENTER’ key. After this restart, your computer and this should solve your issue if no issues proceed ahead. 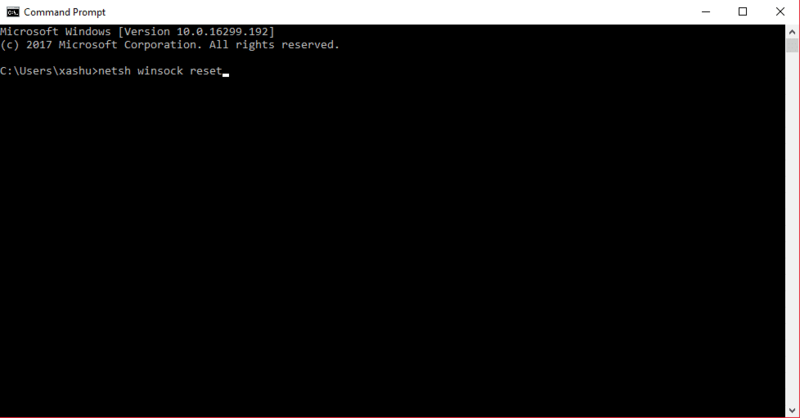 Now in this method also, We will be using “Command Prompt” so open it again in Administrator mode. After the Command Prompt is open in Administrator mode, Type in it the following commands. Next, we need to flush the DNS to clear the previous records so that no iteration may occur. And press Enter key again. After that is done reboot your computer and this should resolve your issues. The cache can also cause the “DNS Probe Finished No Internet” that we are facing. So let’s start by clearing the cache of your browser. Here I will be explaining about Chrome and Firefox browser only as they are the ones that are widely used if you use any other browser just do a google search and should be able to find the solutions If not just comment done, and I will help you. You can press a simple hotkey CTRL + SHIFT + DEL, and it will open a new tab in your browser. 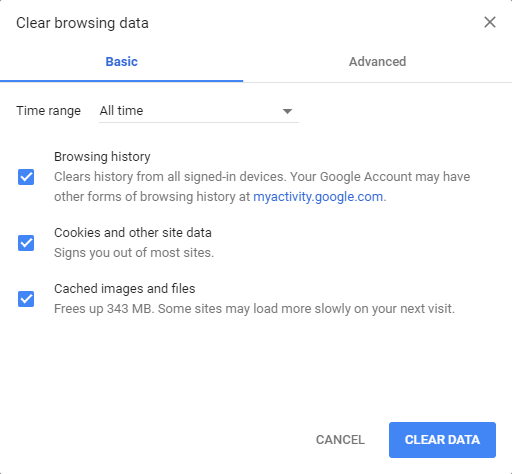 In that you will find varies things which will be cleaned you can check and uncheck them as per your needs and click on Clear Data. If the issue persists, Try reinstalling the browser as you might have edited some settings due to which you are facing that problem. If the issue still exists, then one reason could be the outdated or corrupted drivers. You can update your network adapter drivers to solve the DNS Probe Finished No Internet error. Follow the steps below to perform that action. Type “Device Manager” in the windows manager to access device manager or the same can be accessed via the control panel. Under Device Manager, search for “Network Adapters” and click to expand that option. Find your Wireless/WLAN Driver on it, Right click and then click on ‘Update Driver Software‘ option. Select your network hardware, and click Next. Look for the WLAN Driver CD since you will need that or you can also download the driver as per your PC configuration and use that. If the driver update is successful, you’ll see that on the next screen. If it’s done, your problem will be solved, and you can try connecting to the Internet. If you have recently installed any new software which accesses internet look for it and try uninstalling it or there could be some web monitoring or filtering application running in the background which is the cause of the issue. Uninstall them, reboot the device and you should be able to access the internet properly. So, Guys, this is all the solutions I could find to solve the problem Dns_Probe_Finished_No_Internet error. I hope after trying the above methods, you will be able to resolve the DNS probe finished no Internet error that you faced. 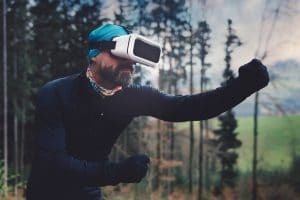 Please let me know if the methods worked for you or not by commenting down. 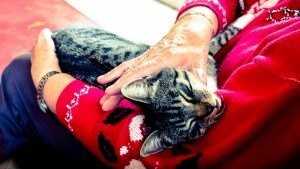 I would to hear your experience and might update the post with new ways to eradicate the DNS issue.